Your support helps develop science-based solutions for a healthy, safe, and sustainable future. There are many ways you can help put rigorous, independent science to work to solve our planet’s most pressing problems. We are pleased that UCS continues to receive recommendations from the United States’ premier charity rating agencies, Charity Navigator, the Better Business Bureau, and the American Institute of Philanthropy. 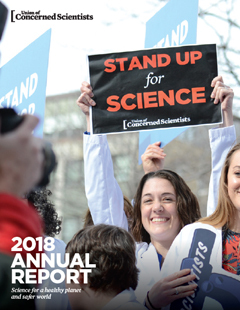 Your investment in the Union of Concerned Scientists is all the more valuable, because to preserve our integrity we do not accept corporate or government grants. Your gift is building a healthy planet and a safer world. UCS is a 501c3 nonprofit organization and all gifts are tax deductible. UCS has developed a win- win approach that involves working together with corporations, federal and state policy-makers, and citizens to craft practical solutions to make our lives better. After years of UCS coalition advocacy and analysis, it's now law in New Mexico that 100 percent of the state’s electricity must come from carbon-free resources by 2045.